What does your country specialise in? Some countries are really good at spicy foods. Some countries are excellent at public services, like hospitals and stuff. Maybe your country has the best waterfalls or the strangest buildings or the most polite people. Well, I’m proud to tell you that no other country in the world has as many signs as Britain! We’re number one for signs. There are signs everywhere in England. Britain is 30% forest, but 77% sign. There are about 4.6 billion signs per person in the UK. The names “Sign,” “Warning” and “Don’t” are now the most popular names for babies in the UK. 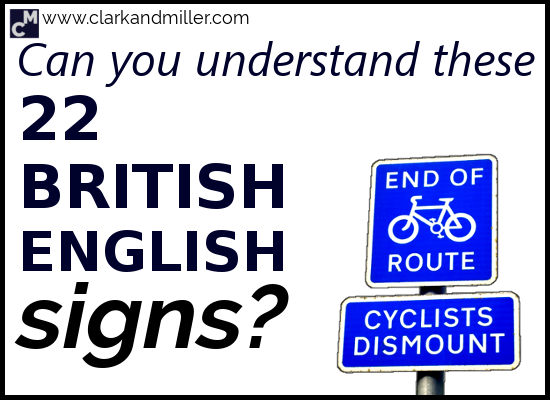 So if you’re planning a trip to the UK, you need to understand what the signs mean. What’s more, the type of English that’s used on signs is a bit different from the type of English we use when we’re speaking or reading the news or writing an essay. Signs have their own special language. I’ve seen a lot of signs in the past week. Here are some of the more challenging ones. You can only use this at home. Don’t put food rubbish here. Just house rubbish. You can rent this shop. This shop is going to be destroyed. This shop will let you do anything you want. It’s kind of liberal that way. The door has stopped working so you can’t use it any more. Leave some space for people who can’t walk. Donation plea! We need books! We have a deadline! Give us books! We’re desperate! Give us books! We need books! But only good ones, please. Be careful. There are bottles on the walls around here. They might contain milk. Traditional Sunday roast every Sunday, served from 12:00 until 4:00 p.m. Between 12:00 and 4:00 p.m., you can dress in traditional clothes here. You can buy a traditional British lunch here between 12:00 and 4:00 p.m. on Sunday. If you walk into this place between 12:00 and 4:00 p.m. on Sunday, they’ll force you into the oven and cook you. Your dog is disgusting. Keep it away from me. You can’t take dogs here. Bring your dog, but don’t let it use this place as a toilet. The path is finished. Get off your bike! The path is finished and this hill is too difficult to cycle on. The path is finished. Everything is finished. Here are some shopping bags that someone else has used. Be nice to yourself. This container carries your bags for you. Please take as many shopping bags from this as you like. Look out for the cars. There are lots of cars. Keep going. Don’t turn back now. Don’t park here. We might need this space to turn around. It’s good to hug people from Scandinavia. You should have a few Scandinavian things in your life. Go to Scandinavia and hug people before you die. Be careful. There's a step here. Think about how the people around you are walking. Don’t let anyone take this container. Please take this container away. I don’t want to see it again. No one knows who built this building. There are no security guards here. Be careful. You can’t come in without permission. There's a bit in the road that comes out. You might want to think about slowing down so it doesn't damage your car. A slope where you can move your car, wheelchair or pram from one point to a higher (or lower) point. You can’t sleep on the street, drink anything, take drugs or just exist here. So go away! It’s nice here so you can sleep comfortably, just don’t take drugs or drink or leave rubbish on the floor. This place is nice – no one ever sleeps badly, drinks, takes drugs or causes problems. Ever. Have you told the security guard that you’re here and paid him? Have you bought a ticket and stuck it to your car window? Have you paid the old woman in the corner so that you can dance in front of her? This is where you can use the toilet. This is where you can meet in groups of more than 3 people. People are great, aren’t they? Dogs are stupid. Get a cat instead. If your dog uses the toilet here, please put its poo here. If you see a dead dog, put it in here. People might want to steal our stuff. Close the gate. Danger of floods. Please close the gate. There are animals eating the grass around here. Please close the gate. This is a great place to go fishing away from other people. If you try and fish here, you’ll have no luck. Don’t fish here. This place belongs to me. They’re my fish. I will call the police and have you arrested if I catch you fishing here. I swear! The world is made up of lots of small pieces of love. Love doesn’t exist. It’s only for fools! Do you have any crazy signs in your own country? Please tell me about them in the comments and we can all have a good laugh together. “Britain is 30% forest, but 77% sign. You’ve clearly never been to France though. Not only are there a ton of signs (the average lamp post has at least 12 of them on it), they’re often written in acronyms/initialisms, so no-one actually knows where they lead. Remind me to send you a picture. And really? Could there possibly be somewhere in the world with more signage than the UK? Back to that old sense of competition between the Brits and the French! And yes — do send a pic!